None of the following apps is perfect, but the same holds true for the apps built directly into Windows 8—hence the point of this article in the first place. Part contacts list, part social media hub, Microsoft's People app is a central bucket for all the personal associations you make via email, Facebook, LinkedIn, and Twitter. Although this built-in app shares Facebook and Twitter updates, it's confusing in the way it jumbles together all your services. Likewise, People is definitely not a worthy Twitter client. And no worthy Twitter clients are available in the Windows Store yet. An official Twitter app is in the works; but until it arrives, we'll all have to make do with third-party alternatives. 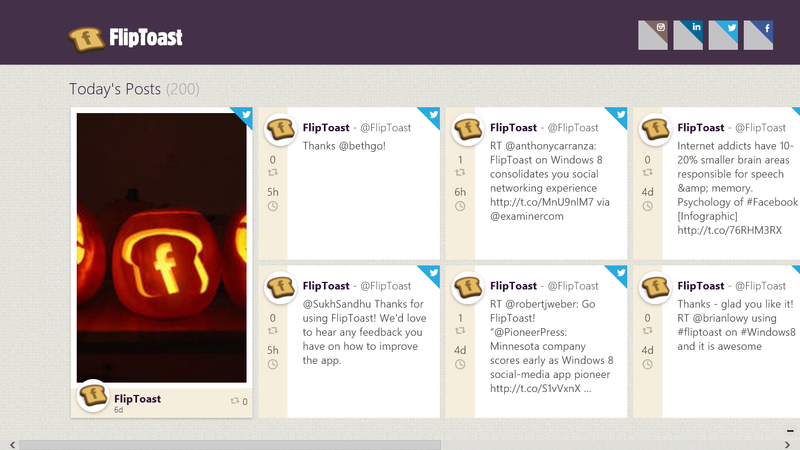 Luckily, we have FlipToast, an app that commingles Facebook, Instagram, LinkedIn, and Twitter in a relatively easy-to-use interface. Among other features, FlipToast allows you to like, tweet, retweet, share, favorite, and post to the four services it supports. Its interface isn't immediately intuitive; but once you start using it, you'll probably find it more hospitable than the People app. And just to make sure you stay a good friend, FlipToast even has a birthday-reminder tool. You can find FlipToast on the Windows Store for free. FlipToast makes social networking simple and concise. Microsoft's Video app has a split personality. It's a storefront for purchasing the latest movies and TV episodes, as well a video player for your own personal content. Unfortunately, when we tried it, shilling commercial content seemed to take precedence, leaving many PCWorld editors wishing for a deeper, more robust video-player app. PressPlay is an excellent alternative for viewing your local files. It supports great touch controls that allow you to adjust the volume, change the video's position, and browse videos with the flick of a finger. 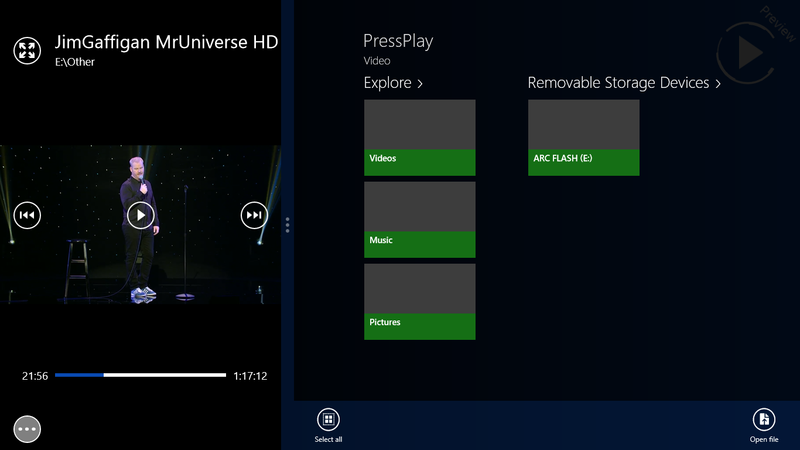 It doesn't offer any videos for sale, but that's a good thing—and a thing best left to the app built into Windows 8. PressPlay is free in the Windows Store. PressPlay offers easy-to-use controls and file browsing. Microsoft's Messaging app lets you quickly chat with anyone in your contacts or Facebook list, and it even supports video chat. That's great for communicating with the friends you have on those networks, but you'll probably want to chat with people on myriad other services too. IM+ is the go-to place for any messaging needs. That's why, as with the Mail app (see below), we recommend using the tried-and-true Google calendar as the alternative. You have to access it via your browser, of course, but you'll be able to see all your schedules at once without worrying about hacking the app. And yes, you can put Google Calendar on your Start screen: Just pin it to Start as you would any other URL, and pretend that it's an app. We still love Google's calendar. Microsoft's cloud-storage service boasts hooks into nearly every device within the new Windows ecosystem and beyond. You can access SkyDrive file storage on a Windows desktop, a Mac, a Windows 8 tablet, a Windows Phone, and even iOS and Android devices. SkyDrive is also integrated into various Windows 8 and Windows Phone 8 apps, granting you quick cloud access and sharing when you need it the most. 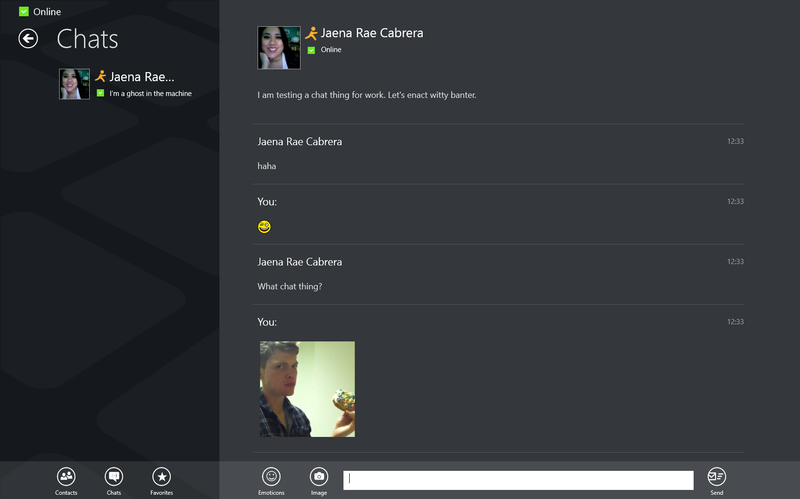 In fact, the new Web-app version of Microsoft Office is reason alone to love SkyDrive. 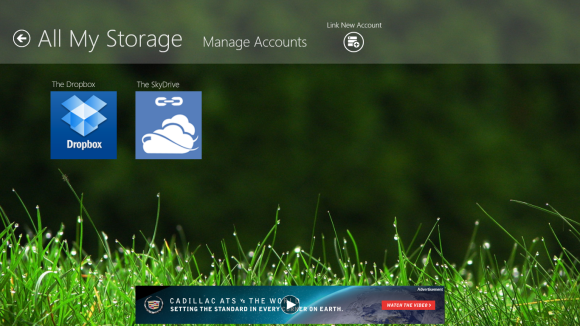 Yes, SkyDrive is fantastic—but it doesn't sync with Dropbox, the once de facto leader in cloud storage. Enter All My Storage, a comprehensive app that brings together all the big cloud-storage systems, including SkyDrive, Dropbox, and Box. After you link your accounts, you can easily search through all of them in one place. The app even comes with a built-in media player to play local content or stream Dropbox media. It's free in the Windows Store if you're willing to tolerate some advertisements, but you'll also find a paid version for $3 that comes with cloud statistics and more themes, and does away with the advertising. Link all your cloud accounts to one easy-to-manage app. Photos is the central depository for all your photos and videos, whether you keep them on SkyDrive, local drives, Facebook, or Flickr. It's actually not a bad app, but exploring one's options is always nice, right? Albums HD offers a great way to "save your memories in one place." The app allows you to store your photos in customizable albums and then share them via slideshows that sport different transition effects. It even supports a Live Tile option so that you can view your photos from the Start screen. 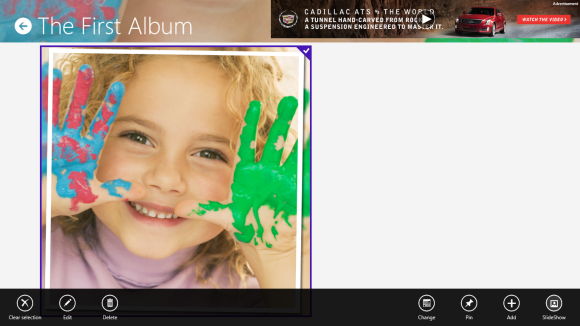 Albums HD is $1.49 on the Windows Store. AlbumsHD provides some organization to your photos, and cool slideshow features. Like the Video app, the Music app allows you to enjoy your music, as well as to preview and purchase all the newest and best music that Xbox Music features. But if you're looking for an inclusive music player that doesn't try to sell you music (and if you're not a fan of iTunes), check out MusicBee, a powerful, free program for any music lover. Unfortunately, no new Windows Store app is available for it yet, but you can install the program just as you would any other Windows program (assuming that you don't have a Windows RT device, of course). MusicBee sports nifty tools for song tagging, as well as for finding local shows and upcoming music releases. You'll also find a minimized music player, and various themes and skins. MusicBee is a powerful music tool. If you are a fan of streaming music, try Spotify (for those who know what they want to listen to), Pandora (for those who want to discover new music), and TuneIn Radio (for those who love listening to live radio).